The Court of Session in Edinburgh. A north-east committee has been accused of deliberately ignoring the evidence when it agreed to slash business rates for firms because of the oil and gas downturn. Lawyers for the Grampian Rates Assessor told the Court of Session that the area’s appeals committee “trespassed outside its proper providence as finder of fact” when it made the landmark ruling a year ago. Commercial property firm CBRE Ltd won a key verdict at the Aberdeen Valuation Appeal Committee in January last year. The committee agreed that the North Sea slump had caused a “material change of circumstances” for the company’s clients and as a result the rateable value of their premises should be cut. However, it could still be overturned after the Grampian Assessor appealed the verdict. 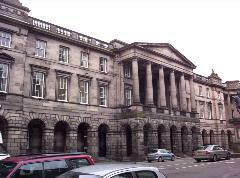 A final hearing was held yesterday at the Lands Valuation Appeal Court, a division of the Court of Session in Edinburgh. Defending the decision, Steven Stuart QC said that the oil and gas downturn between 2014 and 2016 was a “significant and exceptional event”, which clearly represented a material change in circumstances. But he was quizzed by the judges, including the Lord Justice Clerk, on the way the committee assessed the impact of the downturn, including the use of backdated figures, and why there should be relief if the rateable values were still higher after the crash than when the properties were last assessed. Lady Dorrian said: “They seem to be starting from the point of looking at what has happened in the oil industry and then looking at whether there has been an effect from that, and in a sense turning cause and effect on their head. Brian Gill, representing the assessors, claimed the committee had “disregarded a straight-forward picture and went on to make what I submit was a selective and unfounded use of the evidence” in order to reach an “established” position. However, Mr Stuart said that it would be “astonishing” to claim that the committee members had made an error by taking account of their own observations on the impact of the slump on city premises, in addition to the evidence presented to them. The judges will now consider their verdict.